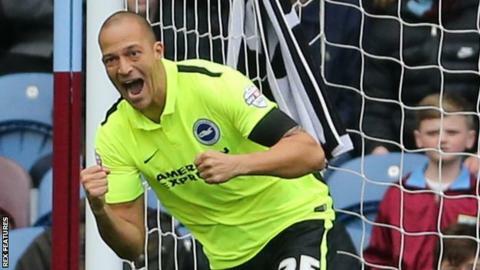 Brighton stretched their unbeaten start in the Championship to 17 games as they drew with Burnley at Turf Moor. Bobby Zamora put the visitors in front from close range on 58 seconds after Tomer Hemed's shot hit the bar. Andre Gray equalised from the penalty spot three minutes later, his 11th goal of the season, after Lewis Dunk pulled Michael Keane's shirt. Both sides had chances to win it, with Burnley's Chris Long poking the best opportunity wide in injury time. Chris Hughton's Brighton, who have now drawn eight of their league matches this season, remain second but are level on points with leaders Hull, while the Clarets stay fifth. Burnley, forced into their first change in five games with Rouwen Hennings coming in for the injured Sam Vokes, had barely touched the ball when they fell behind. The Clarets' defence failed to clear, which left Zamora the simplest of tap-ins for the 178th goal of his career. After Gray's composed penalty levelled matters, the game flowed from end to end inside the opening 20 minutes as Brighton goalkeeper David Stockdale pulled off two fine saves and Hemed smashed over. Things eventually settled down either side of the break but came to life again in the closing stages as both sides went in search of a winner. Burnley's Scott Arfield dragged a shot inches past the post while unmarked before substitute Long stabbed off target when he should have done better. "Brighton are a good side and they've made a mark for themselves this season by being unbeaten. "We've opened up enough chances to win the game. But it was a very close game between two even sides I feel. "The good thing I like about this group is they don't take knocks to heart. They come and react immediately and I thought they did. I thought we were on the front foot for a lot of the game against a good side." "I thought it was a fair result actually. After two very early goals, I suppose a lot of people might have thought it was going to be that type of game. Match ends, Burnley 1, Brighton and Hove Albion 1. Second Half ends, Burnley 1, Brighton and Hove Albion 1. Attempt missed. Chris Long (Burnley) right footed shot from the centre of the box misses to the left. Assisted by Andre Gray. Offside, Brighton and Hove Albion. Bruno tries a through ball, but Elvis Manu is caught offside. Attempt missed. Bruno (Brighton and Hove Albion) right footed shot from outside the box misses to the left following a corner. Corner, Brighton and Hove Albion. Conceded by David Jones. Attempt blocked. Elvis Manu (Brighton and Hove Albion) left footed shot from the left side of the box is blocked. Assisted by Jake Forster-Caskey. Substitution, Brighton and Hove Albion. Elvis Manu replaces Tommer Hemed. Attempt missed. Scott Arfield (Burnley) left footed shot from the centre of the box is close, but misses to the right. Assisted by Andre Gray with a cross. Corner, Burnley. Conceded by Jamie Murphy. Dale Stephens (Brighton and Hove Albion) wins a free kick on the right wing. Attempt missed. Scott Arfield (Burnley) right footed shot from outside the box is high and wide to the left. Assisted by George Boyd. Attempt blocked. Jamie Murphy (Brighton and Hove Albion) right footed shot from the centre of the box is blocked. Assisted by Lewis Dunk.